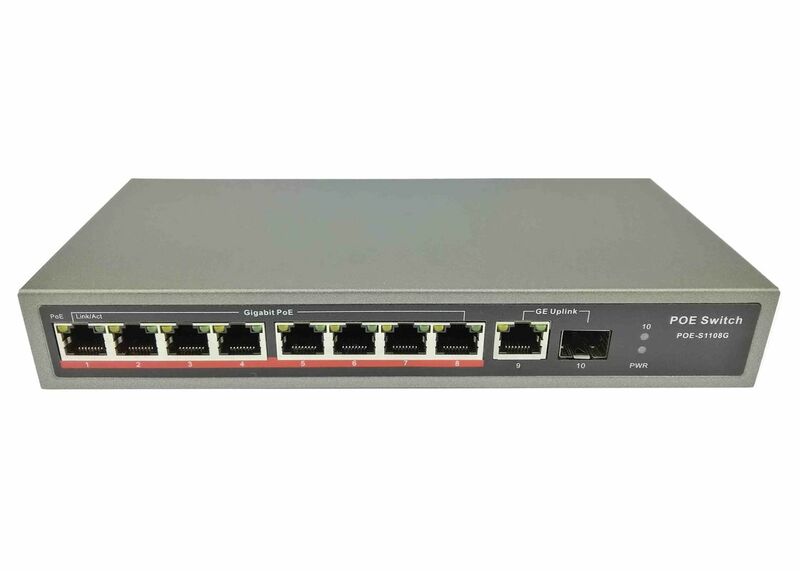 POE-S1108G is 8 port unmanaged Power over Ethernet switch, comply with IEEE802.3af/at and equipped with 120W external power supply, which enables it compatible with most Powered Device (PD) such as IP Camera, VoIP Phone, Wireless AP, etc. It has one port Gigabit RJ45 uplink and one port Gigabit SFP uplink which comes with several cascading solutions as appropriate. 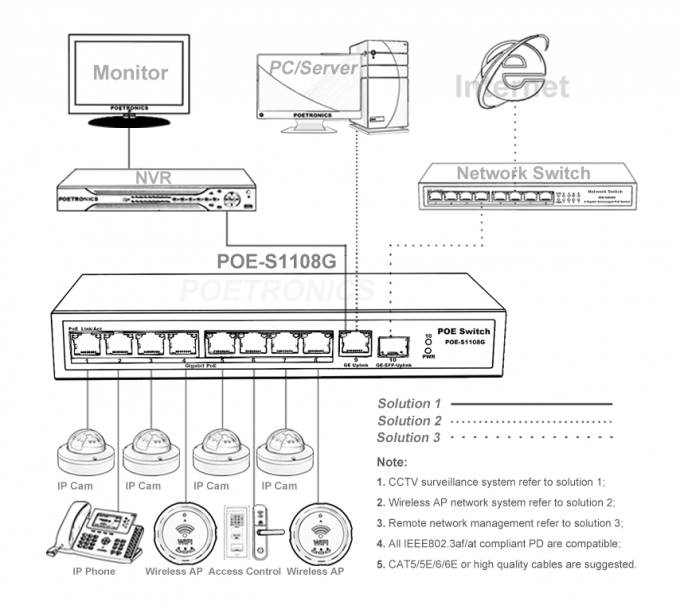 There also has Normal free communication, VLAN port isolation and IP Cam monitoring transmission 3 different operating modes switchable as user required. Every single port output power up to max 30W and pass through pins 1,2 "+" and pins 3,6 "-" over qualified Ethernet cable Cat5 or Cat5e, Cat6, Cat6e or higher quality ones that will finally reduce power loss in the transmission especially for the Ethernet power system that has a long distance between PSE(Power Source Equipment) and PD(Powered Device). 8 Gigabit POE + 1 Gigabit RJ45 Uplink + 1 Gigabit SFP Uplink. Compliance with IEEE 802.3, IEEE 802.3u, IEEE 802.3ab, IEEE 802.3af/at. Auto MDI/MDIX, Store-and-forward, Lightning protection. MAX 30W for a single port, total external input power amount 120W. Supports wire speed switch and jumbo frame up to 9KB transmission for all ports. PoE working conditions can be read and troubleshot through involved LED indicators. System Setting N: Normal free communication among all ports, apply to universal data exchange, 100-150m transmission distance.